To sign up write an email to cloud.danslab@gmail.com. and the humming is made devoid of human sound. collected in iced pearls that once cascaded from mountains. In Deep Brown Sea the world is simple and enormous. It is a giant vessel that is largely empty and every move and word echo for years. There are no transitions, nothing is to be arranged or to be accounted for. ‘Deep Brown Sea’ is a solo show by Billie Hanne. The piece was shown in Brussels, Amsterdam, London, Thessaloniki and will later in 2016 travel to Iceland. The milk of a star that no longer hides the flesh in ignorance. This slender book is all about face and form. Waterborne. 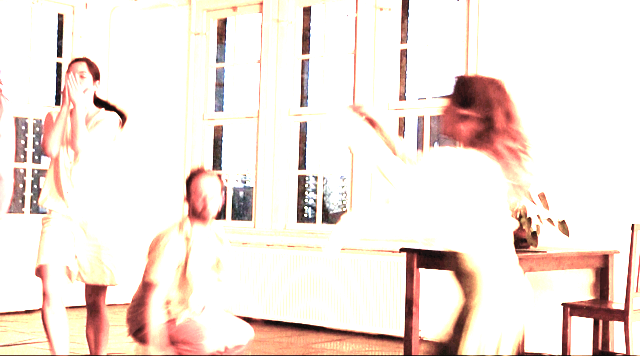 An encounter between dancer, poet Billie Hanne (BE) and vibraphonist, composer Els Vandeweyer (BE). Vandeweyer’s ability to create harmonies like virtuoso fractals and her way of zigzagging through traditional material makes for an interesting combination with Hanne’s lyrical way of creating poetry by abstracting words and morphing them into new mythologies. This is their first artistic meeting. Els Vandeweyer is currently engaged in Quat (with Fred Van Hove, Paul Lovens, and Martin Blume); Trio Grilo (with Ute Wassermann and Aleks Kolkowski); Spin Track (with Olaf Rupp and DJ Illvibe); a duo with Fred Van Hove, and participation in two orchestras (Pascal Niggenkemper´s Vision 7 and the Serenus Zeitblom Oktett). In the next months Billie Hanne is performing in ‘Deep Brown Sea’, a solo on tour in Europe, ‘Melchior’ and ‘All for Big B!’, two pieces by her company Wheelgod, and ‘’Mud like Gold’ by Allen’s Line, the Julyen Hamilton Company. “You are stupid!”, we told the watchman. We stole his key and locked him in eternal sleep. There he bathed and looked younger than we could ever be. Melchior did not disapprove, but busied himself with the World elsewhere. “What can I do?”, he said. And we too saw he was better off taking care of his plants and horses, of his dahlias and sea star collection. I remember one of us pointing at the waves until they became transparent and we entered a new day. MELCHIOR is the imagined space in which new action is being produced and is lightly threaded by the facts of common history, rather than the burden of it. The action itself is sharp and precise, a direct implication of the action that precedes. Words are spoken occasionally and reveal a poetry of place and moment, of brevity and ephemeral gravity before they are let go off and disappear. This is a company piece performed by Wheelgod under direction of Billie Hanne for four dancers. An essential class for dancers wanting to explore and produce poetry in performance. The dancer who makes dance and poetry from a body in motion deals with an intimate mythology that is raw and textured, three dimensional. Deze cursus onderzoekt met eenvoudige instructies een intieme mythologie van lichaam en stem. Lichaam – spraak – ruimte – tijd als één complex geheel dat altijd in beweging is. Open voor iedereen die zin heeft! Poet and dancer Billie Hanne makes work through radical handling of poetry and dance, of body and tongue. Her work presents the refined body in space and reveals the matrix in which speech and action take place. The result is a rare and physical lyricism that is quick-witted in its dealing with time, space, object and light. 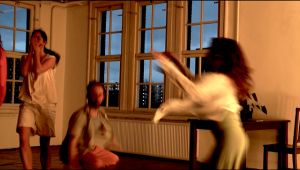 From May 7th till May 14th her work will be shown in different locations for performance in Den Haag as well as sharing her work process in two workshops. One for professionals, one for amateurs. Billie Hanne started her artistic career as dancer and poet in the Julyen Hamilton Company ‘Allen’s Line’, in 2009. In 2012 she established Wheelgod as a platform to make ensemble pieces under her direction. Currently they are performing ‘Melchior’. A piece for four dancers. ….. She is also a growing soloist and is on tour with her solo ‘Deep Brown Sea’. This is her fifth solo work. Billie’s Roos is supported by Gemeente Den Haag, Prins Bernhard Cultuurfonds Zuid-Holland and Gravin van Bylandt stichting.